It’s hard to believe that it’s almost one year since Chopin’s 200th birthday! But here’s a treat for you as we approach his 201st. This BBC documentary is now available in eight parts. Watch the first part here and find the rest on YouTube. To mark the 200th anniversary of Chopin’s birth, this film follows young pianist James Rhodes on a journey to Warsaw, Paris and London to discover the real women who had such a powerful influence on the composer. Exploring the events of Chopin’s life, Rhodes encounters the singers who enchanted the composer with their voices: Konstancja, a young soprano and the object of his teenage affections; Delfina, the sexually notorious Polish Parisian emigre countess; fellow composer and opera singer Pauline Viardot; and, during the final few months of his life, the Swedish operatic superstar Jenny Lind. Threaded through the narrative of the film is a selection of Chopin’s piano music performed by Rhodes, while rising young opera singer Natalya Romaniw performs some of the signature arias that thrilled Chopin. Featuring contributions from Chopin experts including the interpreters Emanuel Ax and Garrick Ohlsson, his biographer Adam Zamoyski and piano guru Jeremy Siepmann. Last weekend I had the pleasure of hearing Dr. Ron Bishop, Professor of Culture and Communication at Drexel University, speak to prospective Drexel students and their parents. He spoke about his research for his new book, When Play Was Play: Why Pick-Up Games Matter. He spoke about his research and the stories he collected from people who remembered hanging out with their friends, playing ball in the streets, and inventing their own games such as “Tennocky” a tennis-hockey hybrid. He also talked about how the new generation of high school and college students have grown up with a full schedule of organized activities, leaving them no room for unorganized play or just getting together with friends to have fun, the truly “creative” activities. Unfortunately, there’s no going back to “the good old days” when people hung out on the front porch until it got dark and kids ran around the yard playing kick the can and gathering fireflies in glass jars. If you don’t believe me, just take a look at the students in this documentary. 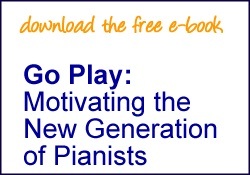 But there are some ways that we can encourage creative play in the context of structured piano lessons. Teach five-finger patterns, chords and scales in all keys until it is second nature. Every couple of weeks pull out the fake books for fun. Match up friends to play duets together. Encourage your students to sing. Throw an impromptu piano party – everybody brings something to play. Throw a listening party. Listen and discuss. Recycle music books. Have the students trade method books and then skip through the book and only play what works! Learn a piece by watching a YouTube video. 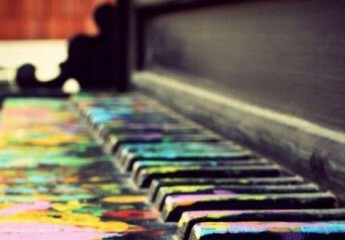 Maybe someday (when the electricity is out, or the network is down) you and your friends will gather around the piano. Who’s going to be ready to play? I have found that the use of the word “position” in beginning piano lessons is not helpful in the long-run. Many young students quickly become dependent on knowing what position they start on that they never really learn how to read lines and spaces. I find myself telling the little ones that there are 88 keys and since they only have ten fingers they are going to have move their hands away from C position, Middle C position, and G position at some point. Then they have a bit of “scary” fun lifting their hands out of “position” and plopping them down randomly all over the keyboard. Kudos to jazz pianist, Dror Perl of SheerPiano who has put together a series of “Color” piano books which snap students out of their comfort zone from the first book –Blue, Contemporary Music with a Harmonic Twist. I appreciate the fact that from the opening pages, the left hand starts on a note other than C, F or G. For example, The man in the blue house, (shown above) starts on G#. The 5th finger of the left hand moves chromatically up to A and then down to Eb and the harmonies are labeled. As the student progresses through to Red, Jazz, Blues and Funk the rhythms, phrasing and articulations, and harmonies become more complex – perfect for students of all ages who want to dip into jazz and a more improvisatory style.The pieces sound complicated but are still fairly easy to read and memorize. And who can’t help but love the colors – inside and out!